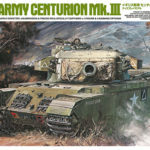 This 1/35 scale assembly kit model depicts the British Army Centurion tank. 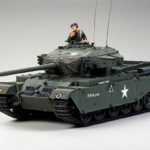 The Centurion was designed to incorporate the best of the British infantry and cruiser tank concepts, and was an extremely successful vehicle that would serve British forces from its production post-WWII to the 1960s. This Mk.III variant was deployed in the Korean War, Suez Crisis and other conflicts. It packed a significant punch with a 20-pounder gun. This is a Mini 4WD racing machine. It recreates the fictitious Rowdy Bull race car and it has the honor of being the first model on the new FM-A chassis. 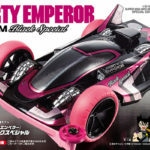 This is a special color variation of the Liberty Emperor Premium (Item 95027), which was a premium version of the car driven by Jingi Otokogi in the Japanese cartoon “The Wind Racer! Otokogi.” This product artfully combines a black base with pink accents. The body is mounted on the Super-II chassis, which is highly adaptable and speedy. Furthermore, it is molded in pink ABS for the first time! This entry was posted in Future Releases on June 21, 2017 by admin.